Yesterday I posted my own thoughts on The Princess and the Goblin and today Rebekah from BekahCubed (who is dreaming of swine) is here to share her concluding thoughts in order to kick off this month's book club discussion. 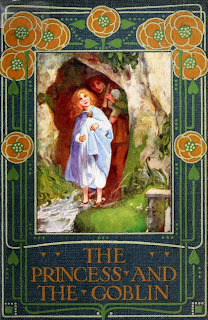 "The peculiar quality of the 'joy' in successful Fantasy can thus be explained as a sudden glimpse of the underlying reality or truth....in the 'eucatastrophe' we see in a brief vision that the answer may be greater—it may be a far-off gleam or echo of evangelium in the real world....The Birth of Christ is the eucatastrophe of Man's history. The Resurrection is the eucatastrophe of the story of the Incarnation. This story begins and ends in joy. It has pre-eminently the 'inner consistency of reality.' There is no tale ever told that men would rather find was true, and none which so many sceptical men have accepted as true on its own merits...."
~J.R.R. Tolkien from "On Fairy Stories"
J.R.R. Tolkien writes of the delight of fairy stories, of glimpsing truth in fiction. He sees the fairy tale's "eucatastrophe" or "sudden and favorable resolution of events in a story; a happy ending" as a foretaste (or backtaste, as it were) of the great turning points of human history: the Incarnation of Christ and His subsequent Resurrection. I love how clearly that can be seen in George MacDonald's The Princess and the Goblin. The Princess and the Goblin is story, not allegory. Yet at every turn, it gives glimpses of something true, something beyond this world. And is that not what fairy tales ought to do? They ought to take us outside of our worlds such that we would see our world with new eyes and love truths that we did not cherish when stated propositionally. This story seems to be about a simple goblin plot to steal away a princess and thus secure the subjection of the light-dwelling world. And it is, but also so much more. It is also the story of Providence, of belief, of trustworthiness, of good and evil. And, it finds a way to convey truth beyond morals. There are many books that are good moral books that teach children how to be good, moral little people - and these are generally poor excuses for stories. But a good fairy tale, on the other hand, can teach truth (both implicitly and explicitly) without being dull. Because the good fairy story doesn't point to who we are and what we ought to do, but to some external truth that we can believe and delight in and respond to in appropriate action. For example, I love the little exchange the Princess Irene has with her great-grandmother after Irene brings the miner Curdie up to visit her great-grandmother and Curdie doesn't recognize or acknowledge the great-grandmother's existence. Then, turning again to the lady, "What does it all mean, Grandmother?" she sobbed, and burst into fresh tears. "It means, my love, that I did not mean to show myself. Curdie is not yet able to believe some things. Seeing is not believing - it is only seeing. You remember I told you that if Lootie were to see me, she would rub her eyes, forget the half she saw, and call the other half nonsense." "Yes, but I should have thought Curdie-"
"You are right. Curdie is much farther on than Lootie, and you will see what will come of it. But in the meantime you must be content, I say, to be misunderstood for a while. We are all very anxious to be understood, and it is very hard not to be. But there is one thing more necessary." I love the layers of truth this simple story reveals. We learn that, contrary to what we so often think, seeing is not believing. We learn that two people can see one thing from two different perspectives - and that is valuable to understand the others' perspective. And we gain a little theological insight when we learn that the God-like great-grandmother chooses whether to reveal herself or not. As the story goes on, we will learn the circuitous route by which Curdie comes to believe that the great-grandmother exists and seeing his journey to belief may give us hope as we struggle with our witness. This is the power of the fairy tale - truth telling. Not propositional truth that can be easily filed away in our mental fact-boxes - but truth that must be embraced, enjoyed, and acted upon. I'm so glad we were able to join together in reading this particular fairy tale this month! Did you read along with us? Please leave us a note and a link to your own blog post if you have written one up. We're curious for your thoughts!